The classic, natural wood finish on these library lounge chairs fits in with any library décor. 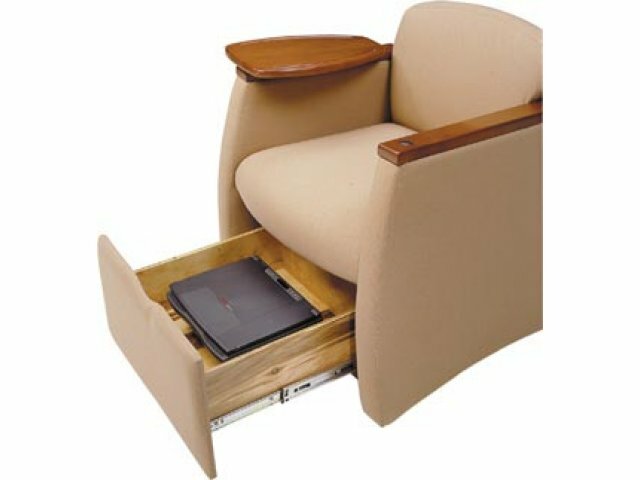 Under-seat storage drawer provides ample storage of research materials, laptops and more. Enhance your library's furniture plan with these lounge-style library chairs. The Genesis Team Library seating series from High Point adds luxury, convenience and style to any school or public library.These library lounge chairs feature a tablet-arm to support notebooks, binders, laptops and any other research materials without need of a table, making them ideal for group study, brainstorming, research corners and conference rooms. Ample storage space lets users keep multiple research materials within easy access. Available in a wide selection of rich fabric and vinyl upholsteries. Classic Finish: Classic, natural wood finish fits in beautifully with any décor. 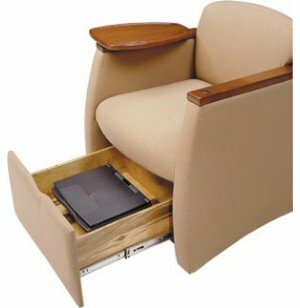 Highly Durable: Armrests, tablet-arm and storage drawer are all constructed of quality maple wood. Aesthetic Storage: Under-seat storage drawer offers concealed, aesthetic and easy-access storage of research materials, school supplies, laptops and more. Team-Friendly: Allows for comfortable group research, collaboration, conferences and group study – with no need for a table. Luxurious: Armchair style offers a luxurious look and extra comfort. Laptop Support: 360-degree revolving tablet-arm supports laptop use and note-taking, and mounts on either the right or left side. Fire-Retardant: Seat and back are padded with fire-retardant foam; all fabrics are compliant with the CAL 117 fire code. Mobile: Rolls easily on dual-wheel casters. Attractive: Available in a wide selection of rich fabric and vinyl upholsteries.